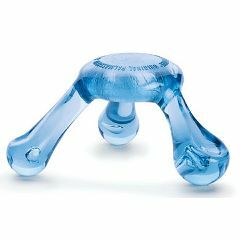 The Original Palmassager™ is one of the most efficient massage therapy aids available anywhere. Hold it firmly in the palm of the hand and use one, two or three of its smooth, round knobs to massage tense, tired or sore muscles of the neck, back, shoulders, arms or legs. Give your friend a massage. The three knobs on the Pressure Positive Original Palmassager deliver a unique massage. Use the Original Palmassager over the entire body for soothing massage sensation. For superior massage delivery, an electronic handheld massager may be right for you.